At the Oude Groenmarkt in Haarlem, winks a French lady to hungry and thirsty passengers. 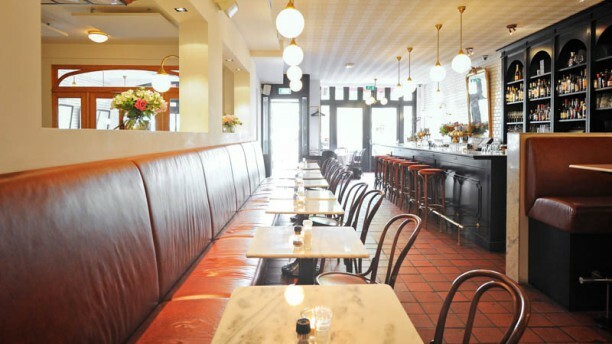 It's Colette Cafe, a brasserie that combines a chic, classical appearance and a casual atmosphere perfectly. On the menu beautifully prepared classics, juicy and tender as it should. On Saturday and Sunday you fall here during Happy Hour oyster with your nose in a refined delicacy, what more could you want? Of course, you also have to be here for good wine. The professional service likes to advise you. A happy, noisy restaurant clearly popular with locals. A short menu with some interesting choices. My seafood linguini was messy and delicious. Husband loved his raw beetroot starter and his steak was also good and well cooked. The staff were friendly and helpful. Would recommend. Mijn favoriete franse bistro! Eten altijd goed, bediening super vriendelijk. Leuke ongedwongen sfeer. Ik at de kip met frietjes met een glas huiswijn erbij. Huiswijnen zijn prima.